It was only a month ago that Spiderman won the lottery – well, now it’s the turn of the Monkey King. The ‘Monkey King’ is a very well known Chinese character, also known as Sun Wukong. According to Chinese legend he was born of a stone, and developed supernatural powers by using Taoist practices. It’s not clear if he used those supernatural abilities to win the lottery, but he is now 176.9M Yuan (approx US$23.7 Million) richer. He said he was a local to Chongqing where the winners press conference took place on Tuesday. Questions for the press were answered for a few minutes, before the man left, apparently heading for a bank in which to deposit his enormous cheque. 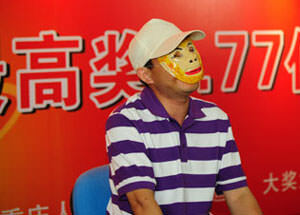 Who will be the next masked winner in China..?